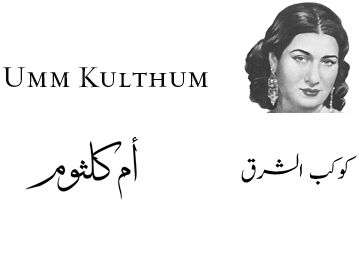 Umm Kulthum (1898–1975) is the greatest singer in the history of modern Egypt. She was one of the last remaining national treasures that emerged from the golden age of modern Egypt (1805-1953). The Lady came into prominence during the mid-1920s and continued her musical career until 1973, reminding the masses of the greatness of the Egyptian heritage and the 19th to mid-20th century renaissance, mirrored by her incomparable voice and out-of-this-world performance.